A long-awaited report draws a picture of the racial and ethnic minorities of Washington County. Washington County elected officials and group representatives praised a report this week that delves into the problems and prospects of the county's burgeoning racial and ethnic minorities. 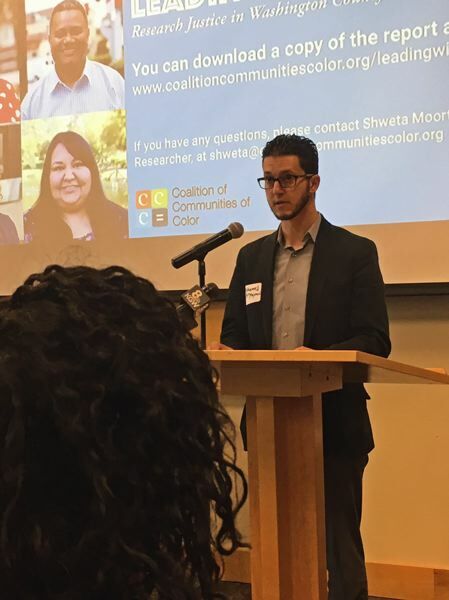 The report was released Monday, June 18, at a gathering organized by the Coalition of Communities of Color, which produced a similar report about Multnomah County in 2012. The principal researcher was Shweta Moorthy, who said she was surprised at how frank people were — and not just minorities. "What surprised me the most was how willing people were to get uncomfortable with what was coming up," she said, "and the way in which our partners realize this discomfort was part of change happening in Washington County." Washington County is Oregon's most diverse, with non-Hispanic whites accounting for about two-thirds of its 600,000 residents, and people of color the other third. But Mohamed Alyajouri, a Portland Community College board member from Beaverton, said the county and Oregon have not always been welcoming to minorities. "They still live here in Oregon despite all the challenges and repeated, systemic attempts at marginalization, sundown laws and restrictive immigration policies — also Islamophobia and xenophobia," said Alyajouri, who also is on the outreach committee for the Muslim Educational Trust. "They continue to counter and push back on persistent racial inequities. Let this data, and this report, be a call to action." Asians and Asian Americans constitute almost 75,000 of the county's residents, second only to Latinos. "Yet we continue to be seen as foreigners, even though 43 percent of Asian communities in Washington County — and 93 percent of youth — are U.S. citizens," said Robin Ye, a field organizer for the Asian Pacific American Network of Oregon, one of the community partners in the report. He has been in Beaverton since 2001. "But we are part of the economic and social fabric of this county. And this report confirms that we do like living here." At the other end are the more than 10,000 residents who identify themselves with a wide range of Native American tribes. Cristal Finley of the Yakama tribe has lived in Beaverton five years. But until she took part in a focus group arranged by the Portland-based Native American Youth and Family Center for the report, she was unaware of the extent of other tribal residents. "It can be isolating in Washington County," she said. "I, too, have felt disconnected from my native community on a daily basis." The report recommends actions in several fields, including: education; understanding of specific needs; economic advancement beyond steps to eliminate discrimination; and the promotion of political and civic engagement. The report was funded by grants and services from six cities, Washington County, Metro, Tualatin Hills Park & Recreation District, Oregon Community Foundation, and United Way of the Columbia-Willamette. Moorthy said government agencies contributed $185,000 over 27 months. "The study we all partnered on is a tremendous opportunity," said Beaverton Mayor Denny Doyle. "It is a chance for Washington County to come even closer together to learn, to understand the different outcomes people of color experience. "Now more than ever, it is incumbent on all of us in our communities and our local governments to step forward and keep the promise of America." Minorities account for about a third of Beaverton residents — and foreign-born residents about a fifth of the total. Doyle said in the same library room nearly a decade earlier, just after he became mayor, he helped initiate the city's first-of-a-kind Diversity Advisory Board. He said the board will take a look at the recent report with an eye toward action. Although Tigard, Tualatin and Sherwood do not have the concentrations of minority residents as Beaverton or Hillsboro, the report says they account for about a third as well. "It's amazing how many we have that are involved in our city," Tigard Mayor John Cook said. "The snapshot (for the area) tells us we need to do more to improve outcomes of our residents of color and to be mindful of engaging in big and small communities that coexist in our city." • Vietnamese and Filipino workers have lower incomes than white workers with similar levels of education. n High-income applicants for home loans were more likely to face denials if they are black (86 percent) or Latino (125 percent) than similar potential white homeowners. • For Native American single mothers with children, 68 percent live in poverty, compared with the national rate of 48 percent. • Somali-speaking students are 197 percent more likely than white students to be suspended or expelled from school. U.S. Rep. Suzanne Bonamici, a Democrat from Beaverton whose congressional district takes in Washington County, said that last statistic bothered her as a member of the House Committee on Education and the Workforce. "We know we have made progress and we have a lot to be proud of here in Washington County," she said. "But we know our work is far from over." Later, Bonamici asked the researcher whether responses were affected by the change in presidents and Donald Trump's harsh comments about immigrants and minorities. "We were mindful that we were writing this report under the current dispensation ... but this report isn't just about the current dispensation," Moorthy replied. "I think community members know that racial justice and the way they live their lives are more long term than one person or one administration." 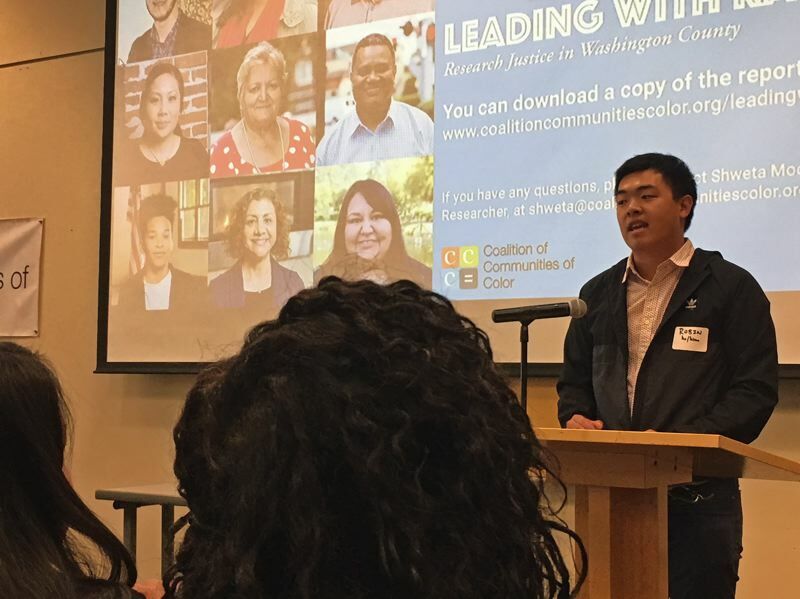 For a link to the executive summary and full report, "Leading with Race: Research Justice in Washington County," by the Coalition of Communities of Color, click here.